Watches of the predecessor brand of Certina, Grana, must have been exported to the USA quite early, as the "American Grana Watch Company" was already registered in 1910. From the middle of the thirties Grana advertisements can be found and around 1944 one sees first indications, in the form of advertisements, that also Certina models were available. 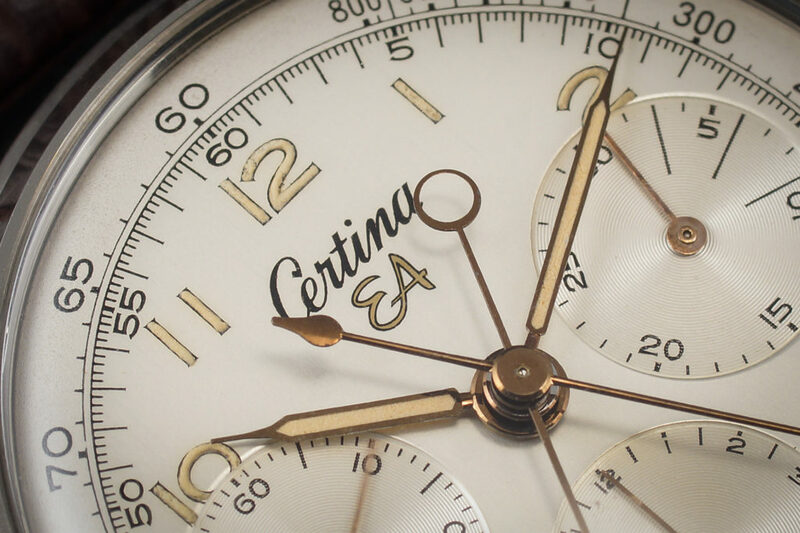 The "Certina Watch Corporation of America", based in New York, was founded at the end of the 1940s. At that time, many Swiss companies were active in the United States and some of them had already had a company representation overseas since the 1890s. 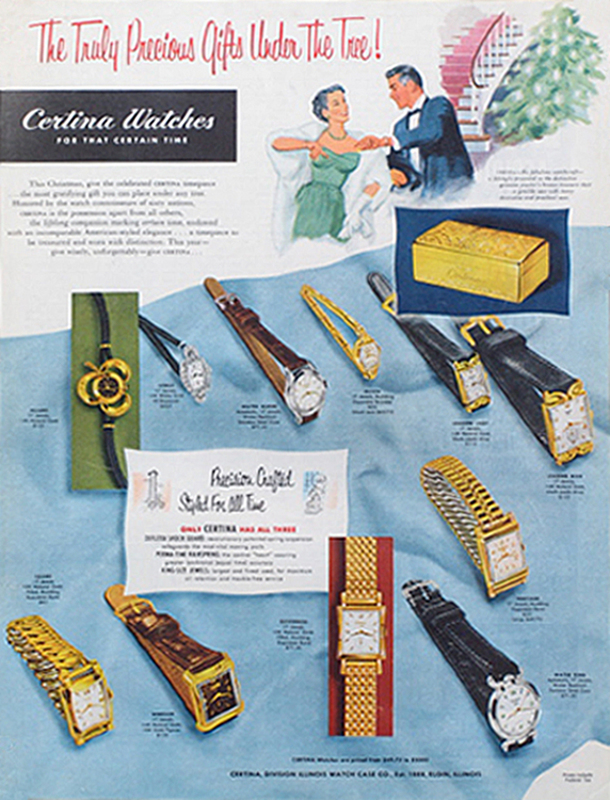 Shortly thereafter, at the beginning of the 1950s, the collaboration between Certina and the Illinois Watch Case Company began. 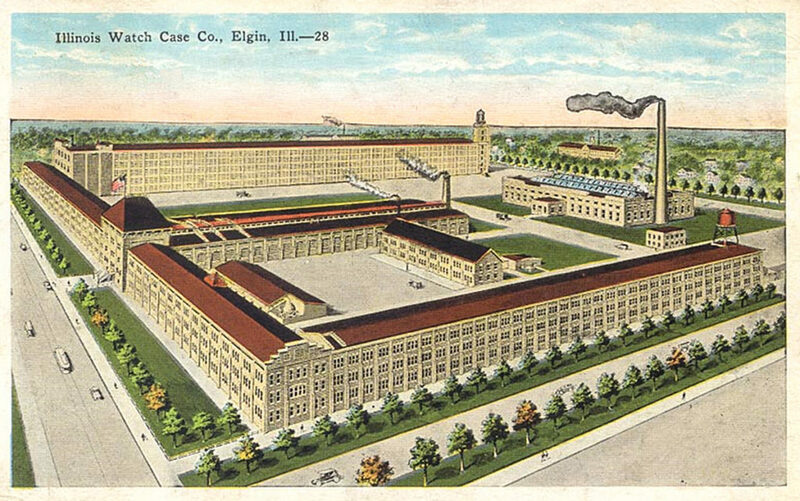 The Illinois Watch Case Company from Elgin, Illinois (IWCCo) was an important manufacturer of watch cases. The company was founded in Chicago in 1873 and moved to Elgin in 1890. For some time it was the second largest employer in the city. They inserted movements of other companies into their own cases, which were designed by themselves. At that time this was a common procedure to avoid customs duties. Swiss companies exported only the movements of their watches and the cases were then manufactured in America. Certina also supplied movements to the Hamilton Watch Company at that time. This also because the American watch industry was fully occupied during the Second World War with supplying the armed forces with watches (and bomb detonators) and therefore missed the development of the automatic movements (noteworthy in this fact is that today Certina and Hamilton are not only united in the Swatchgroup, but their headquarters are even located in Biel in the same building). 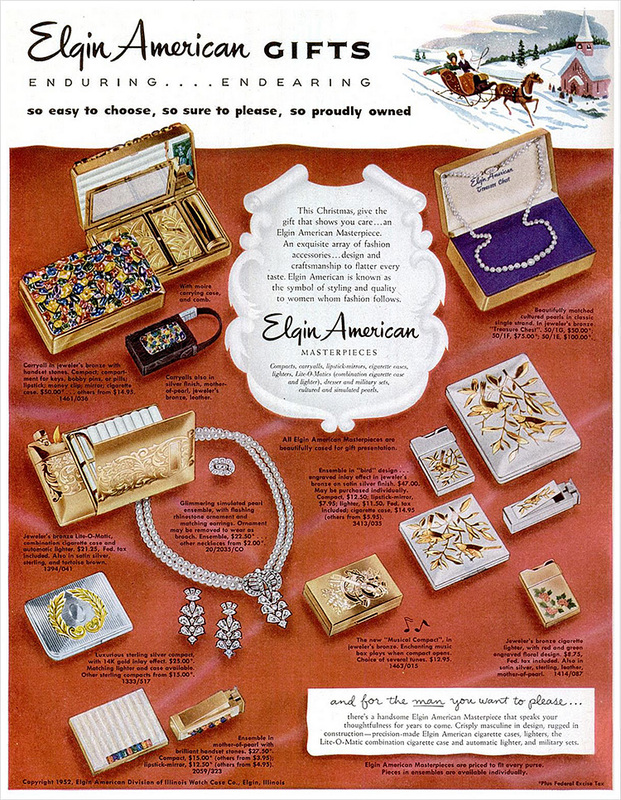 From 1940, due to the difficult market situation, IWCCo also produced other products such as powder boxes and cigarette cases under the brand name "Elgin American". The following advertisement from the year 1952 offers a small insight into the product range at that time. Interesting is the "treasure chest" at the top right, because we will encounter it again in a similar form. "Certina EA is the trade name for a new imported watch line. 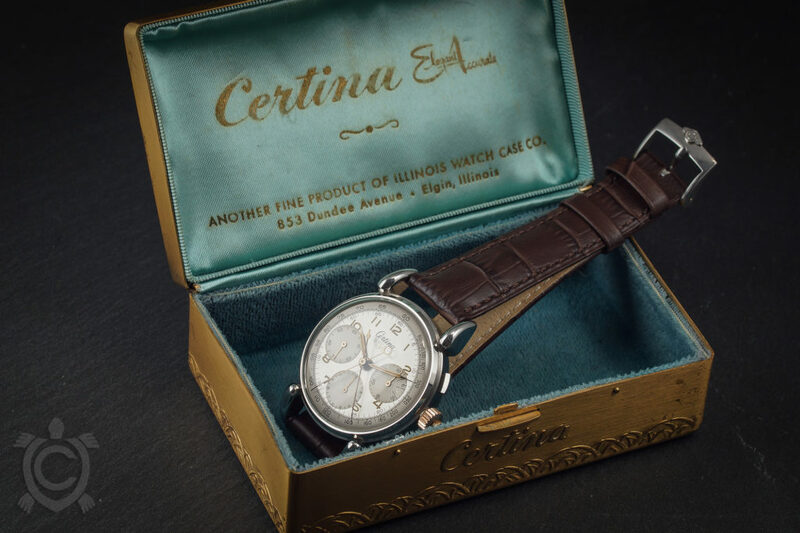 Illinois Watch Case Co., manufacturer of Elgin American powder boxes, cigarette cases, lighters, costume jewelry and sideboards, has announced the introduction of the Certina EA watch line. As already mentioned, the IWCCo distributed various articles under the name "Elgin American". Furthermore, an entry in the "Catalog of Copyright Entries" of 1952 reads: "Illinois Watch Case Company, d.b.a. (doing business as) Elgin American; thus d.b.a. Certina Watches. It can therefore be assumed that the abbreviation "EA" in the brand name also stood for "Elgin American". In the pretty watch box which was given to the Certina EA watches in the USA (you remember the advertisement above), the E and the A on the inside of the lid is supplemented with "Elegant and Accurate", but the slogan "Elegance and Accuracy since 1888" was also used in the watch boxes in here. So this will have been rather a play on words. By the way, this box was even advertised as a "jeweler's bronze treasure chest with a gem-like case and many decorative and practical uses". Apart from the Certina EA models, the "normal" Certina models seem to have continued to be sold on the American market in parallel. Some models even seem to have been available in both versions. In the EA models several Certina movements were used, but interestingly enough also "non-Certina" calibers like a Felsa 694 Bidynator were mounted, probably especially in cheaper models. Some very exquisite movements like the Venus 185 in the Rattrapante Chrono with the reference 5826 or the Angelus 250 were used in the chronographs. 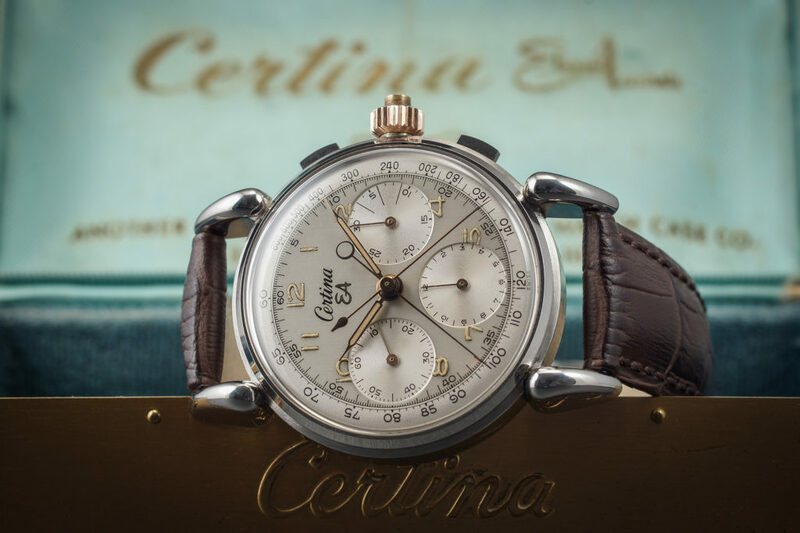 Certina never developed an own chronograph caliber, so there were no Certina movements available here. 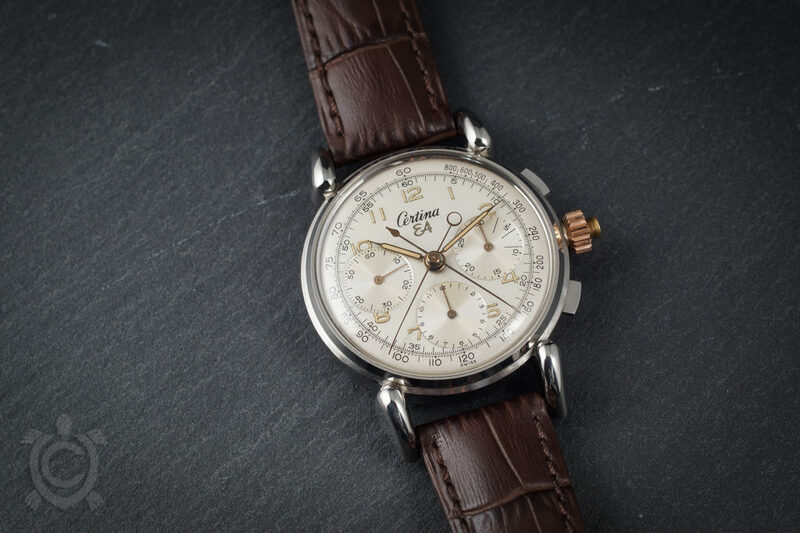 Around the time when the brand Certina EA, a high-quality and therefore expensive Swiss import product, was added to the portfolio in 1951, a series of losses began for the IWCCo. Sales were affected by the change of consumer preference to cheaper watches and for the most expensive Certina models up to 5,000 dollars could sometimes be sold over the counter. Moreover, in the mid-fifties there was growing opposition to the duty scam. The company finally stopped manufacturing watch cases and in 1956, the name of the Illinois Watch Case Company, the parent company, was changed to the name of its subsidiary Elgin American, Inc. In 1957, the machines used to make the cases were auctioned off. Foreign competition penetrated the company's markets and by the end of the decade the business was drastically reduced. The relocation of production of the Elgin American line to Japan was a financial disaster, and the Dundee Avenue plant was abandoned completely in 1963. In 2011, the buildings were demolished. 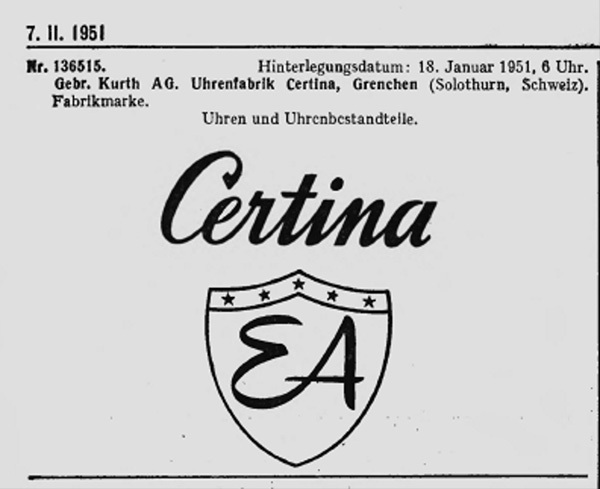 With the cessation of the watch case production in 1956, the distribution of Certina EA watches was most probably also terminated, so that these watches were only produced for about 5 years. In my opinion some of the most beautiful and interesting Certinas were created during the collaboration with the IWCCo. The American designers tried to outdo each other and most of the watches are inspired by the Art Deco style. This is why they are more likely to be classified in the 30s and 40s than in the 50s. Indeed, Art Deco had already reached its peak in Europe by the end of the 1920s. In the USA, however, the style survived until the 1950s and was used, among other things, for the design of vehicles. Unfortunately, there is only limited information about the cooperation between IWCCo and Certina. Maybe more details will become known over time. In the following I would like to show you a special example from this cooperation. This is one of my absolute favorite watches from the house of Certina. I like chronographs and the rattrapante function is, so to speak, the supreme discipline under the chronos. A special feature of these watches are the two second hands, instead of one on normal chronographs. This makes it possible to stop intermediate times. At that time a sensation! The drag hand is actuated by a pusher integrated in the crown. The stainless steel case has a, especially for those times, hunky diameter of 37mm. The lug to lug width is 49mm and the height 13.9mm. The lugs are so-called "Fancy Lugs". These were very popular at that time and, it seems, especially to American designers. On closer inspection, the dial has two different surfaces. The outer part with the tachymeter scale is matt, while the inner part has a brushed finish which changes into a greyish colour depending on the angle of view. In the first picture you can see that effect well. A rare Venus 185 hand-wound movement ticks in the watch. This caliber was manufactured by the Fabrique d'Ebauches Vénus S.A. in Moutier between 1940 and 1952 and is based on the Venus 175, which was complemented by a split-seconds mechanism and a twelve-hour counter. It has a small second on the 9, a 12-hour counter on the 6 and a 30-minute counter on the 3. 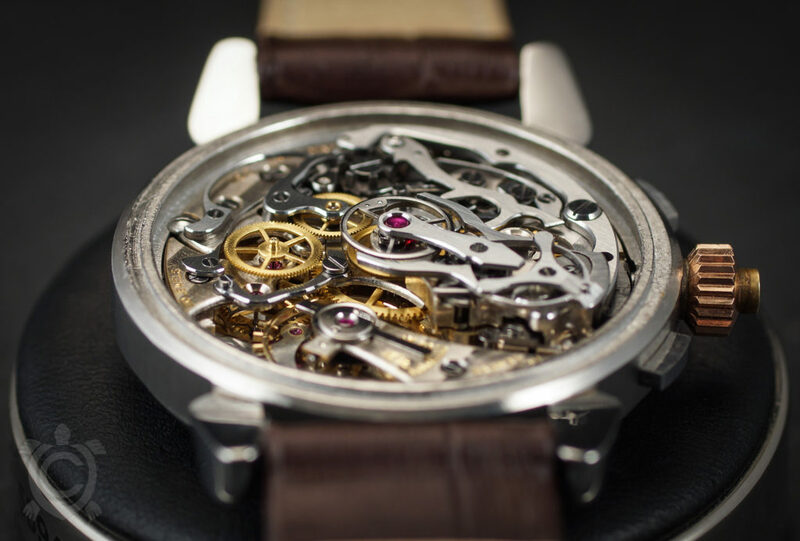 The movement runs at 18,000 beats per hour and has a power reserve of 44 hours. The Venus movements have been used by various brands such as Breitling, Record, etc..
As you can see, the movement in this watch is stamped with Record. I assume, also because of the great overall condition, that this watch was never sold but built from stock parts. There are however still further pieces which also used a movement stamped with Record. 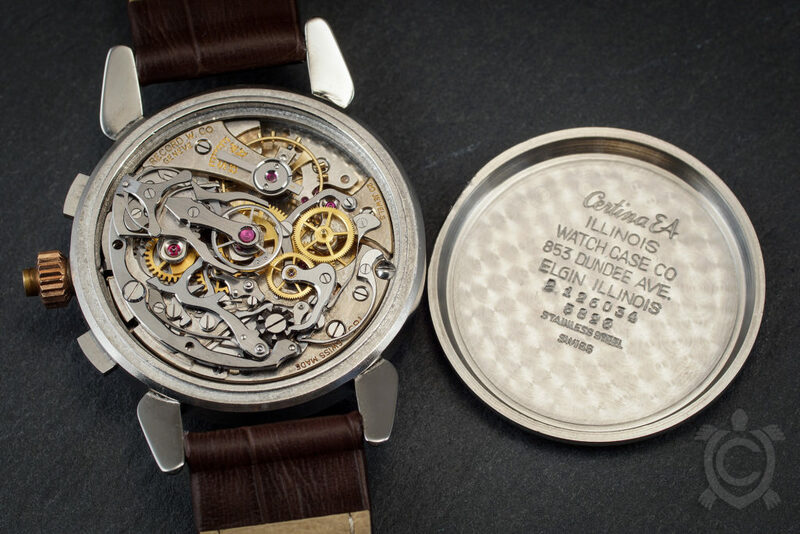 In the case back you can see the "Certina EA" engraving and below it the address of the Illinois Watch Case Company. Furthermore the serial number and the reference number. It's interesting that the serial number seems to fit into the scheme of the normal Certina numbers and could be assigned to the year 1952. I'm really glad that I was able to acquire this watch. You can find a handful of pieces which have been auctioned in the last 10 years, and I also know of two or three pieces which are in collectors hands. Nevertheless it is of course not easy to get such a reference. Mostly these pieces are guarded and are also very sought after on the other side. Finally a picture with the beautiful original box, which I already mentioned above.